The Crescent Thaali Set inspired by classic pearl earrings from Deccan is wonderfully versatile. Configured as a crescent moon nestling a full moon with a built in carrying handle, this set is a piece of art. 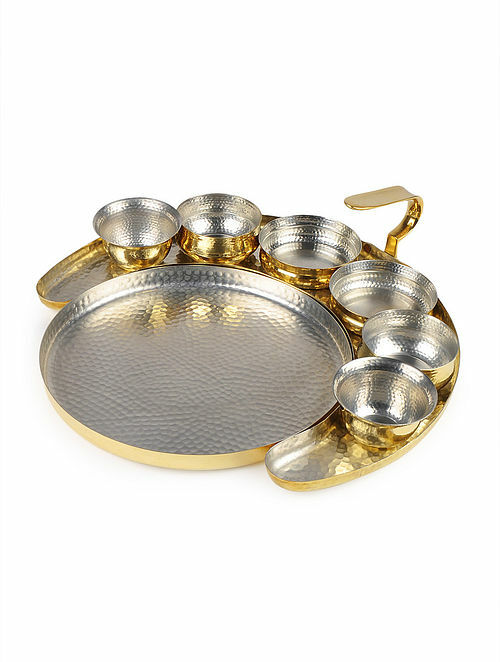 Made of sturdy brass with traditional 'kalai' hand-tinning for food safety, this thaali set will serve directly from the kitchen, become an intriguing welcoming tray, or a presentation of delectable appetizers for your guests.